Enter Coldharbour and destroy the Mortuum Vivicus. The Fighters Guild has sentenced Sees-All-Colors to death for the murder of Jofnir Iceblade. Talk to Merric in the Earth Forge. Listen to Aelif question Jofnir. Solve the red crystal puzzle. Shut down the three blood fonts. Listen to the council's judgement. After receiving the quest from Bera Moorsmith, talk to Aelif at the Fighters Guild in your alliance's final area. The council was unable to find Sees-All-Colors; she must have fled after you visited Abagarlas. Aelif has an idea about how to find her, but first, you need to speak to Merric at the Earth Forge. She opens a portal to him. As you and Aelif run to him, you can hear him preparing the Prismatic Weapon at the forge. He is unsure about Colors' guilt and despises Aelif's plan to have Jofnir track Colors down. He says Aelif thinks Colors is working for the Prince of Lies, and you will find the Mortuum Vivicus with her. His final question, however, is what kind of weapon you want the Prismatic Core to become: a longsword, a bow, a staff, or a great sword. Whichever you choose it becomes the Prismatic Weapon. He asks you to talk to Aelif while he forges it for you. Aelif summons Jofnir and commands him to tell her where Colors is. He says she is in the Halls of Submission along with the Mortuum Vivicus. Your weapon is ready; all you have to do is pick it up from the forge. Then, follow Merric and Aelif through the portal into the Halls of Submission. Inside, you need to focus the set of red crystals so that light beams from each one. You need to use the first crystal to help the others figure out the puzzle, then the second crystal to open the door. Enter the Outer Courtyard. You see Colors standing in front of a swirling blue orb. Aelif urges you to kill her, but Merric asks you to confront her, perhaps sparing her life, if you talk to each of them. Colors confesses that she did indeed kill Jofnir. She worships Meridia who told her to mobilize the guild to oppose Molag Bal. Jofnir refused to listen to her, and Colors felt she had to kill him. She trusts you and asks you to decide her fate. You can talk to her more, or you can decide right away. If you continue talking to her, she says she thinks Aelif serves Molag Bal. She didn't tell Merric because he serves Stendarr and might not have understood her devotion to Meridia. You must decide to carry out the guild's sentence and kill her, or help her finish her mission. She traps Colors, then disappears. She summons Blood Fonts to strengthen herself and Daedric minions to crush you and Merric. There are three blood fonts to shut down. 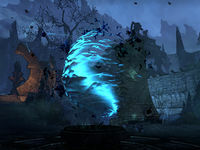 Each acts similarly to a dark anchor: there are Daedra you need to defeat before you can use the pinion to close it. Once all the fonts are closed, it is time to defeat Aelif. She reappears next to the Mortuum Vivicus, then transforms into a titan. When she is defeated, Jofnir appears. He is free! He wants to protect you while you destroy Molag Bal's weapon. To destroy it, you need to throw the Prismatic Weapon into the center of the Mortuum Vivicus. Jofnir teleports you, Merric and Colors back to the Earth Forge. Talk to Jofnir, then talk to Countess Hakruba. You can talk to Merric; he tells you the council will support your choice. Tell the Countess what happened in Oblivion. You discuss Colors, Aelif and Merric. Then, if you saved Colors, you can decide if she stays or leaves. Countess Hakruba: "Sees-All-Colors. Present yourself to the council. The council has decided we will honor the contract to fight the Daedra. 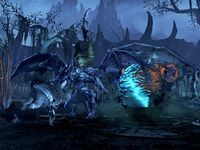 Meridia continues to provide coin through her worldly servants. But we cannot allow a murderer to remain Guildmaster." Countess Hakruba: (if you decided to let Sees-All-Colors stay) "We have decided to award you a new title. The Light of the Guild. You will advise the new Guildmaster in all matters relating to the Daedra for the rest of your days. Penance for the blood on your hands. You are dismissed." Countess Hakruba: (if you decided to expel Sees-All-Colors) "Furthermore, the council has decided to expel you from the Fighters Guild. We will report you to the proper authorities for the murder of Jofnir Iceblade. You are dismissed." Countess Hakruba: (to Merric) "Merric at-Aswala. In light of your service to the Guild. In light of your sound judgement and brave heart, we cannot think of anyone more appropriate than you. You, Merric, are to be the new Guildmaster of the Fighters Guild." General Flaminius Auctor: "It will be your responsibility to oversee completion of the contract established by Sees-All-Colors." Svalkmar the Crude: "Remain vigilant against the forces of Molag Bal." Ra'zaym Iron-Ear: "The Guild s a shield, a bastion for the people of Tamriel. Wear it well." Borogilmith: "You've been quiet, Merric. What do you have to say about all this?" Merric: "I ... Thank you, council members. I accept this position with honor and grace. I swear to my ancestors, I will not let you down." Merric leads you out of the forge. Talk to him outside the forge. He will make sure the forge stays open for you. You can create Kagrenac's Hope set items there. Use the portal to travel back to the guild, then talk to Jofnir one last time. He is finally able to go to Sovngarde, but first he wants you to have the Prismatic Weapon. He retrieved it from the Mortuum Vivicus and can shape it to any form you want. You have the same four choices: great sword, longsword, bow or staff. The damage is the same for the Prismatic Blade (longsword), the Prismatic Long Bow and the Prismatic Flamestaff, along with the other weapon values. It seems that you should pick the Prismatic Weapon to be whatever you are most comfortable using since it always has the same damage. This also means it may make more sense to pick the one-handed version since you could combine it with another weapon and do more damage. The initial choice of weapon type is temporary. This weapon is consumed in the course of the quest. At the end, Jofnir offers you a replacement, and you again choose a weapon type. Prismatic weapon is an Epic quality Orgnum's Scales item and cannot be sold to NPC merchants. This page was last modified on 8 April 2018, at 21:20.